I haven't posted much about the economy lately owing to a time: a lack on my part and the length needed for a post on such a topic. However, a couple of people have made some interesting observations that allow me to weave them together into something that is a little bit more illuminating. – and was feeling deeply shocked. Back to Roubini. He feels that the increase in asset prices is a new bubble over which the Fed isn't watching. Eventually, the bubble will burst when the dollar stops falling and/or interest rates go up and traders, without easy money from the Fed, find they have the sell their new assets to pay back their loans. Oh joy. Of course, without all that easy money, the financial sector would have imploded taking the rest of the economy with it. Well … more than it did at least. prosperity for all” (taken from The Guardian via Tony Wikrent of The Economic Populist). Of course we tried that for over thirty years and it hasn't worked. 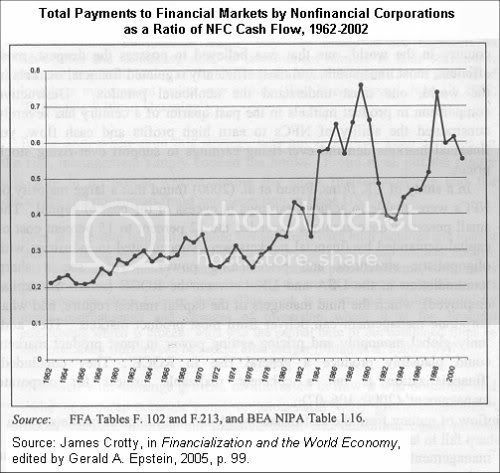 Yes, that is correct that 75% of NFCs' cash flow in 1989 poured out of NFCs and into the financial markets. Seems suspicious that the financial sector's pillaging of the rest of the economy peaks just before the economy tanks, but I won't take correlation for causation without more information. real estate. The trickle-down theory is a lie. promises made by free trade proponents was a lie. capital and the greediness of the wealthy. That said, the 50s & 60s era of shared advancements in income and low debt was replaced in the mid 70s with greater income inequality (50% of all income went to the top 10% in 2007) and increasing debt for the middle class and poor in order to achieve some semblance of upward mobility. After all, the rich's new found wealth needed to go someplace to gain a return. And so I have come full circle with a new bubble on the horizon since that is the only option the "leadership" of our highly unequal economy and political system will allow us.